When it comes to reliable, high-level performance, the Sidi Genius 7 Carbon Road Shoes are second to none. This Mega version is shaped on a larger last to fit those with higher volume feet. I am not a professional bike rider and my last pair of shoes lasted me over 15 years, so I was due for a new pair of road shoes. I have a high instep and liked the option of a Mega shoe. I ordered the my size I was accustomed to. However, because of the more spacious fit, I had to return and get a whole size smaller. The latch system works great. I have worn Sidi shoes since the mid 80's. They make the perfect cycling shoe imesho. The fit, form and function are all spot on. The shoes have improved over the years but Sidi has never missed a beat in the production of their cycling shoes. This is my third pair ( each earlier pair from different editions) of Sidi's. After 30 years plus of pedaling I decide to go for the mega version this time because my feet are changing and need more width. I still prefer the velcro version. I find Sidi's to be very comfortable, even after hours in the pedals. Quality product that lasts. sidi shoes are made to perform and fit your feet as intended! I ride road bikes and use these shoes as my road shoe over my town shoe which I use a different cleat. This is the second Sidi Genius Mega shoe I own. I still use my original but will use the second shoe for a bike at a different location. The shoe is superb and is a life saver for people with wide feet, as many high quality shoes are very narrow which is painful. My primary purpose was to find a wide option so I could ride longer but I have come to find how great the shoes are. The quality is very high as I have had nothing on the shoe peel or wear away even after thousands of miles. Sidi is basically protecting the buyer from having to buy another shoe if a part needs changing, kudos to them, I will be a customer for life. I struggled to find shoes that are wide enough in the toebox to allow my metatarsals to spread when pressing down. Sidi came through big for me with these. Very comfortable, but good grip through the heel and midfoot. Comfortable around the edges, and tension nicely adjustable. As a road rider with wide feet, it is nice that Sidi makes a shoe that allows my foot to feel good regardless of the number of miles I might ride. I had an older pair of Sidi's that I love but did not come in the wider version, the leather stretched a bit so my foot is comfortable in them but hangs a bit over the sides of the sole. With the MEGA, the carbon platform is wider so my whole foot is on a stable platform to push down on, rather than hanging over the edge which is occurring with their standard shoe, thus giving me more efficiency and eliminates any foot fatigue. Definitely try this shoe if you have wide feet, I'm sure you'll be pleased. I'm a EEEEE guy and these offer a comfortable fit. With super feet insert, they have great support and really good power transfer. They could be a tad lighter and offer better heal retention but some of that is probably a sizing issue (I think I went half size too big). Got these a size larger and in the mega version to use as a winter shoe and for ultra cycling (for when your feet swell). They are comfortable, even when too big. Looking forward to more and more miles on them. So far I love them. I don't have this latest generation, but like the other post, I have put in about 12,000-15,000 miles on a pair of the original Sidi Mega road shoes over the last 7 years and they still look absolutely brand new. I have size EE feet, with a nasty bunnion on my right foot, but these shoes adjust incredibly to deal with this awkward foot issues. Got wide feet - get a pair, don't spend another minute in a narrow shoe and learn what pain free riding is all about! My previous Wi-Fi was a bit too narrow so I decided to go mega. They are almost too wide. I put some inserts in the shoes are they are just right. I went with the same size as the previous shoes and I should have ordered a slightly smaller size. Same quality I expected from Sidi. i had the same shoe 10 years ago and have been riding a different brand since. The others were good, but you forget what comfortable is until you come back. Love them! GREAT SHOE FOR WIDE FEET!!!! I bought these shoes after reading several reviews and they were right on. The fit is fantastic for my E width feet. So comfortable and light. I gained efficiency and power. No hot spots!!! Just love the shoes. 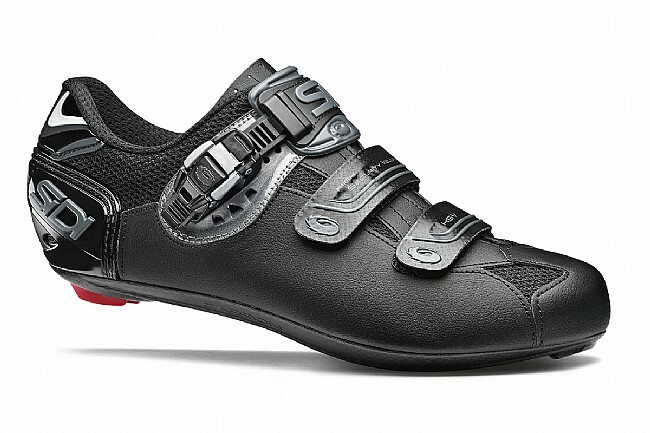 The mega version of this Sidi model really allows my feet to go pain free on long, hot rides. I could not be any happier. You will too!! 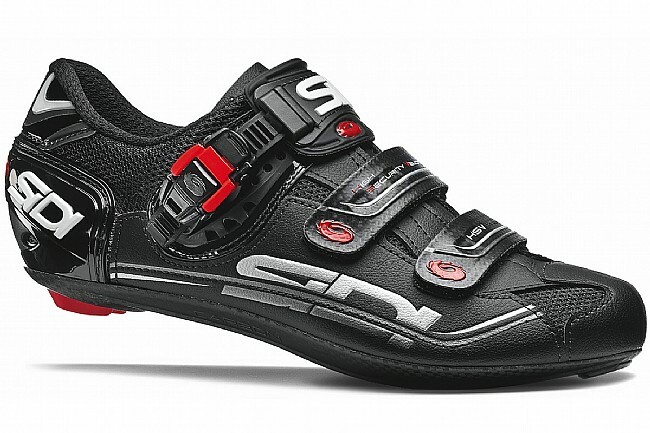 This Sidi version is a great price for a great shoe! bought the mega road shoes early spring.liked them so much,i later bought a pair of the mega mtn bike shoes.very comfortable. I use these shoes for long road rides. They are wide enough to fit my feet. I have unusually high arches. Most regular shoes are too narrow. This is the updated shoe from the Dominator 5. Sidi has cut these a little differently (I have both these and the Dom 5's of old) where they introduced the Mega sizing. 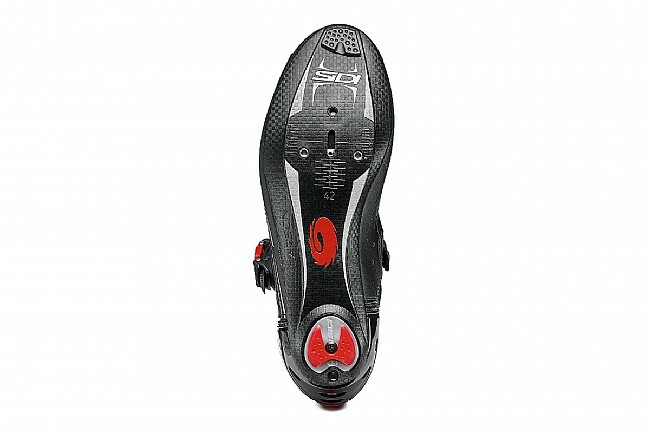 These seem to be cut wider across the ball of the feet and Sidi has reduced the volume of the upper a bit. So these fit me absolutely perfectly. Sometimes the heel can be a bit loose, but just put some plastic sheeting or other material under the insole (you do have upgraded insoles, right?) and they will fit exquisitely. Something about what Sidi made these out of compared to the Dom 5's make them conform to your feet better than the street Lorica uppers that they used before. All of these are subtle differences, but the fit improvement for me was absolutely awesome. Very happy for the upgrade and highly recommended if you have wider than average feet. Otherwise, it's the great Sidi fit and buckle system. Shoes fit like a glove! I have been wearing the same pair of my of Sidi Megas for over 10 years...still feel/fit as though they were brand new. Aside from the scuff marks, this shoe looks practically new. I bike a minimum of two hours a day, six days a week, and these shoes never lose there comfort level. These shoes are definetly worth the price and then some! Sidi shoes put the other makes to shame. My new Sidi's fit like they were custom made for me. Past shoes did not take my tough fit well, but these are great. Adjustable straps and true sizing really beat the competition. Love these shoes!